It's official, my husband has dubbed me the soup queen....I just love soups. They save me so much time, I can make a large batch and we have dinner all week! Budget and time friendly! This recipe is one of my hubby's favorite, combining some of his favorite things, chicken, avocado, sour cream and cheese. Mmmmm! Cook chicken breasts and shred. In a large pot combine all ingredients. Make sure to drain your black beans, corn and Ro*tel. Cook over medium heat for 30 minutes stirring occasionally. Serve with diced avocado, sour cream and lime juice. These are optional but that is how the hubs and I like it. 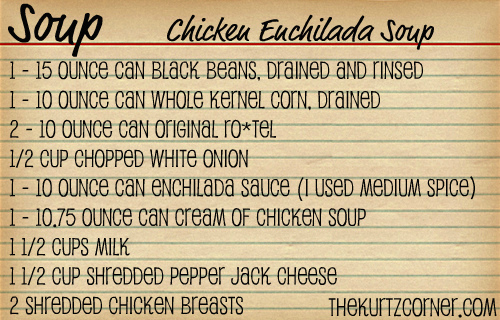 To add spice you can use hot enchilada sauce or add in diced jalapenos. If you feel the soup is too thick, add in an extra 1/2 cup of milk. 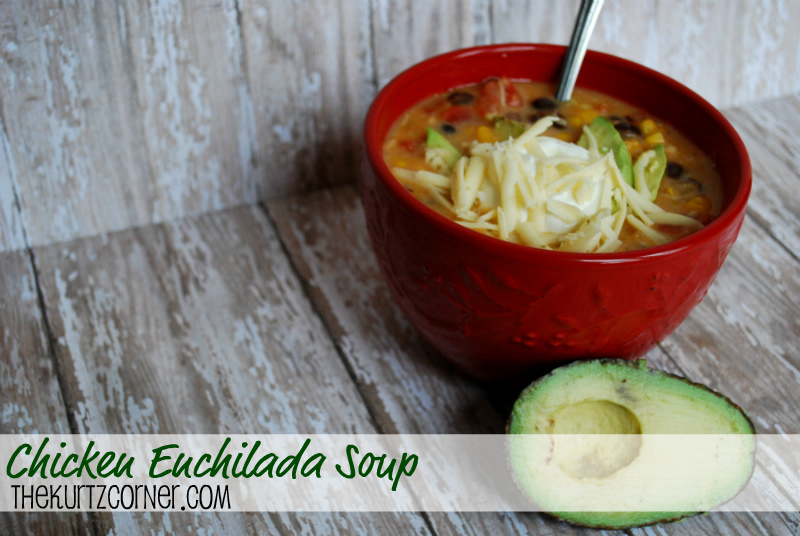 A very quick and easy soup! This recipe yields 5 to 7 servings....depending on how much you like to eat! Enjoy. hi there! 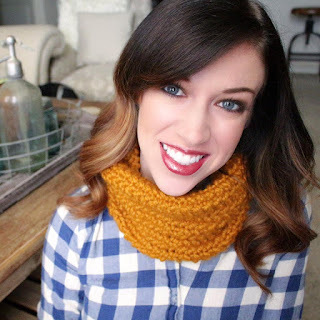 i just found your blog and i am so glad i did! i love these pictures and writing, great post! am definitely a new follower, keep up the great work! would appreciate it if you could check out our blog! oh yum i need to try this delicious recipe one day! Oh my goodness! That looks absolutely delicious! I can't wait to try it! I love this soup and I love your recipe. I am going to try it! Thanks for sharing! YUM! 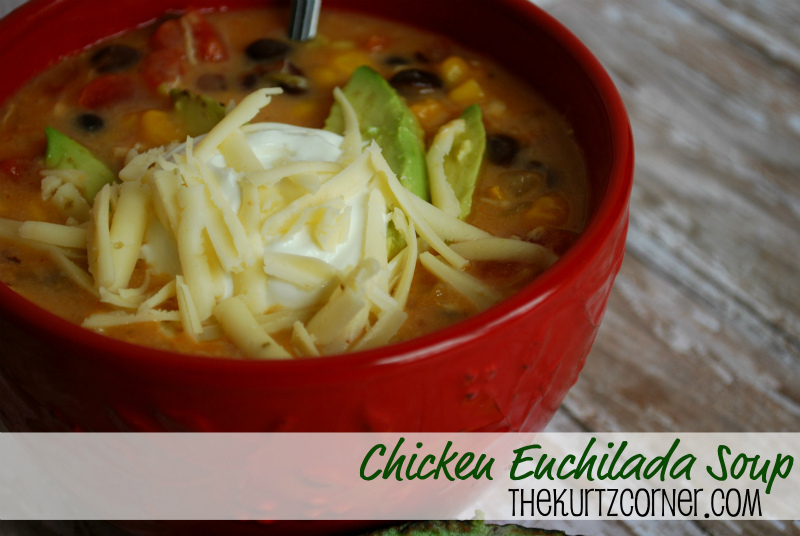 Ive been looking for a good chicken enchilada recipe.. and this one looks great! Thanks Audra! I'm a new follower from Live Laugh Rowe. LOVE this recipe!! My husband is allergic to corn, so I'd have to cut that - but um, yeah other than that it sounds (and looks) perfect! YUM YUM...so gonna make this! Perfect! I happen to have all of these things because we love Mexican food! Going to make this tonight while the hubs is away. Thanks! That looks so delicious and pretty easy to make, too! Thanks so much for sharing at our party this week! Can't wait to see what you are up to next week! This looks and sounds Delicious! Would make a great lunch with the girls. Would love to have link this up at Sunday Round UP! Hope to see you again this week!! Cheers! !